Corruption may not be an issue for your organization but the heightened government focus on fighting corruption and bribery could impact your business. Join this webinar to discuss leading practices to evaluate, mitigate, and monitor potentially costly financial and harmful reputation risks. 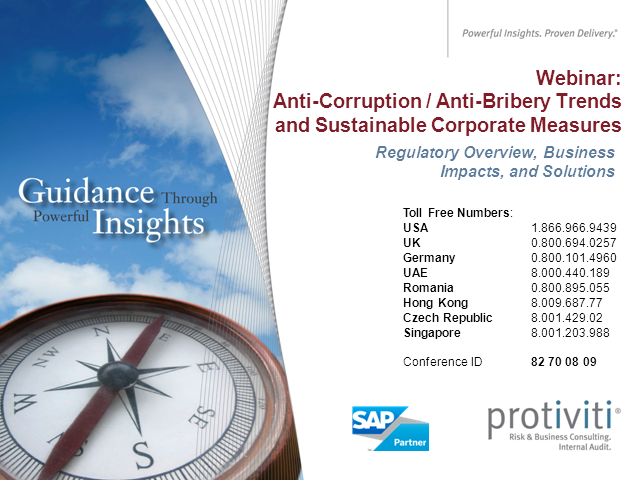 Topics include trends in Corruption / Bribery risks and regulatory landscape (including FCPA fines and implementation of the U.K. Bribery Act). We will also discuss measures companies are taking with employees, agents, and officials to minimize the fact and appearance of corruption and the use of technology to provide sustainable monitoring, and executive oversight using SAP’s Governance Risk and Compliance solutions.